World War II Online: Battleground Europe, also referred to as WWIIOL:BE, WW2OL or BE is a massively multi-player online first-person shooter computer game (MMOFPS) first released June 06, 2001. The game is set in 1940 through 1943 World War II Europe. It is a combined arms war simulation otherwise known as a virtual battlefield. A player can command or crew a variety of accurately modeled aircraft, armored fighting vehicles, anti-tank guns, anti-aircraft artillery, and naval vessels, or fight as a foot-soldier with a variety of infantry weapons. The game is played in real time along-side or against other players as German, British (UK) and French forces in a persistent world. Command structures and missions provide strategic and tactical layers while ranks provide a RPG layer by demonstrating leadership roles. WWIIOL online uses a 1/2 scale map of Western Europe with 30,000 km² of accurate terrain (800 m resolution satellite data). It is commonly recognized as the first MMOFPS. 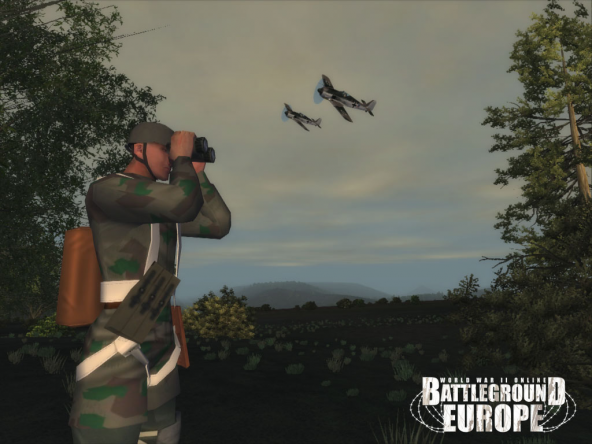 WWIIOL was re-packaged and re-released in 2006 under the new name of World War II Online: Battleground Europe, and the name Battleground Europe is sometimes used to refer to the game. Apple Macintosh G4 processor 1.2 GHz or higher version. This page last modified 2008-05-01 03:32:18.